I finished the Jane Austen shrug, to accompany the Jane Austen dress. Shrugs, by their nature, need a person inside them to give then shape and line. I'm hoping it will fit the dotee, whom I haven't seen for the last 5 months. The tiny cable, edged by moss stitch, is the perfect detail for this otherwise simple design. 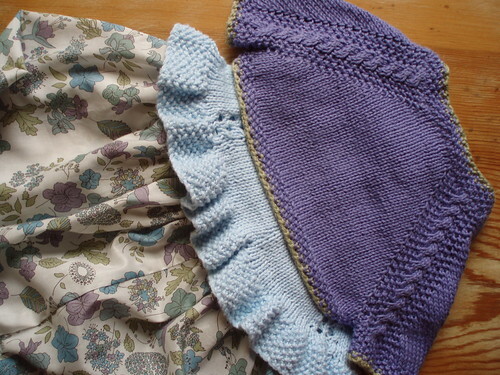 Both the shrug and the dress are from Kay Gardiner and Ann Shayne's Mason-Dixon Knitting Outside the Lines. I'm taking it with me tomorrow on my trip to the Philippines where I'll meet up with the dotee and her parents for Christmas. Maybe the dress and shrug can begin a tradition of a grandmotherly gift of a special Christmas dress. Anne, my backtack4 swap partner in Denmark, has received her parcel of backtack goodies, and so I can finally reveal some of the crafting that's been occupying me over the last month or so. As I've blogged before, the theme of backtack4 was gold (something that glitters), frankincense (something to delight the senses of taste or smell) and myrrh (a gift to give pleasure). My myrrh gift to give pleasure was knitted. It's the inelegantly named Swiss Cheese Scarf by the inspirational Winnie Shih. 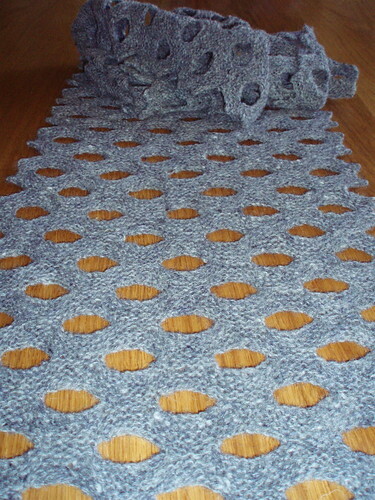 For those with access to Ravelry, the free pattern can be downloaded. It's a simple, symmetrical, fun design. I think it's also very elegant. Lots of garter stitch (why not? ), and lots of casting on and casting off. 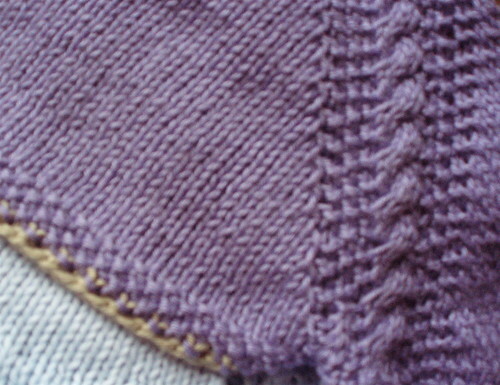 Like most people who've knitted this design, I gradually refined the process of knitting up the small loops caused by the casting on into subsequent rows. I knitted it with wool to which I've developed a passionate attachment - Rowan scottish tweed 4 ply in the perfect shade of grey. It doesn't result in the softest scarf in the world, but it has a slightly felted texture and holds its sculptural shape beautifully. My partner Anne says she likes it and commented cryptically that we have very similar taste in scarves, so I'm delightedly anticipating my parcel from her. For my 'something that glitters', I decoupaged two bangles. 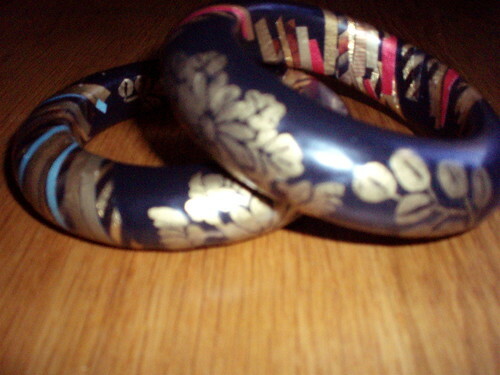 I began with wooden bangles, painted them black and applied cut-paper designs, mainly in gold. I then varnished them (about 35 thin coats), sanded several times, and finished them with a dull beeswax polish. I enjoyed making them - even with the tyranny of fitting in the three coats of varnish I needed to apply each day to finish the project in time. It was interesting to return after several years absence to a craft I practised consistently and passionately for a significant period of time. I think I'll do some more. 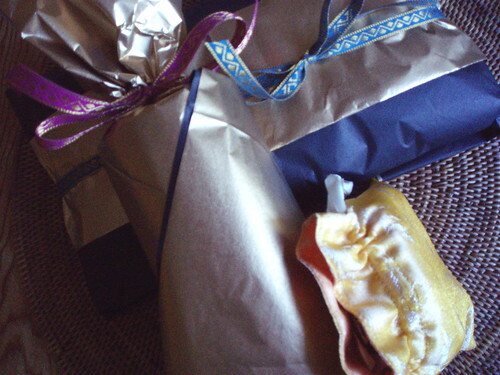 I found it most difficult to decide what to do for frankincense - something that appeals to the sense of taste or smell. Eventually, I applied the very reliable rule that says when in doubt, do something simple, and made Anzac biscuits, using my grand-mother's tattered recipe. I thought that if they were robust enough to survive the lengthy trip by sea to reach Anzac soldiers in the first world war (which is the tale of their origin), then they could survive the modern-day trip by air to Denmark. I have a still unsorted and disorganised box of my mother's and grandmother's recipes that I acquired after my mother's death. Most of my grand-mother's recipes are for baking - cakes, biscuits, slices, scones. My grandparents had a farm where 8 to 10 family members lived, and this number was augmented by another dozen or so people at shearing or harvesting times. 'The men' ate 5 meals a day - breakfast, morning tea, dinner, afternoon tea, and tea. My grandmother's life, and my mother's when she lived on the farm, was a constant routine of cooking and cleaning up. As a result, the recipes are simple and straight-forward. They use easily available and few ingredients and are virtually fail-safe, but every time I make something using one of the recipes, they are welcomed. 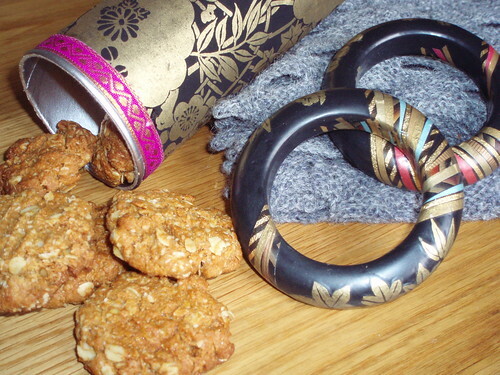 The Anzac biscuits belong to this tradition. I don't do sweet, and I don't do cute. For decades I've been cultivating a personal style that aspires to be straight-forward, simple, clear, unfrilled. At least, this is what I'd like to think. But reluctantly, I've had to recognise that there are significant exceptions to this personal style rule. Something overcomes me when confronted with little girls - particularly those who are too young to assert their own choices. 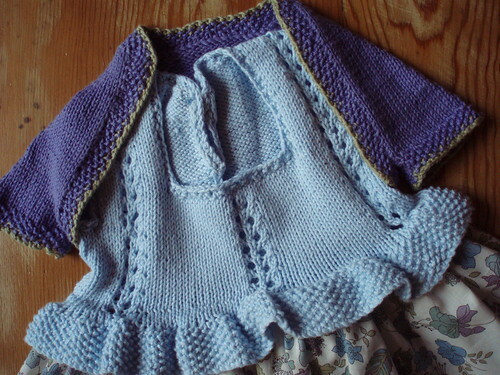 When my now adult daughter was very small, I made clothes for her - frequently they were yoked pinafores or dresses made from combinations of Liberty or Laura Ashley prints that were worn over t-shirts or jumpers as the weather dictated. I was so captivated by these Victorian-influenced images of little girls that I did this despite my intense dislike for sewing. Thirty years later, I seem to be caught up again by the same fantasy. This is what I've made for the dotee (my grand-daughter) for Christmas. 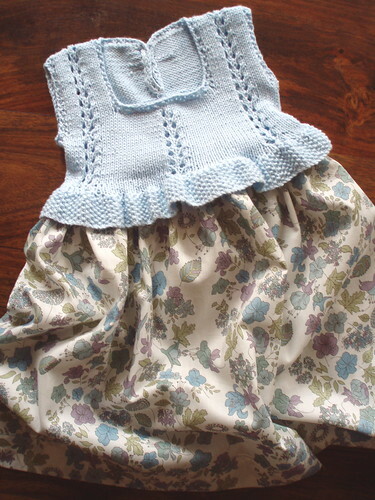 A yoke, frills and tiny floral print fabric. A realisation of all the elements of the Victorian fantasy. It's the Jane Austen dress from Kay Gardiner and Ann Shayne's latest book, Mason-Dixon Knitting Outside the Lines. 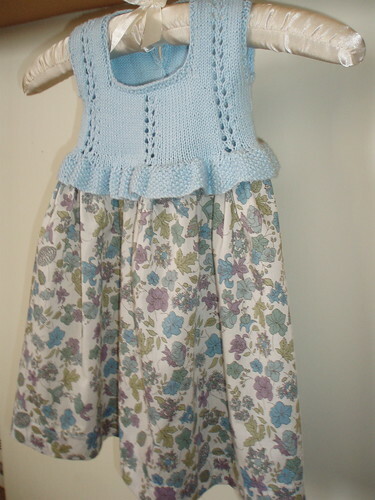 It's knitted from Heirloom 4ply cotton, and the fabric is a Liberty Tana lawn. I'm also making the little shrug that the Mason-Dixon women have designed to accompany this dress. It's in a deeper hyacinth blue. More on that soon. Maybe grand-mothers can be excused their obsession with Victorian images, yokes and frills? Even though I don't usually do sweet, I've decided I'm just going to indulge myself until the dotee is old enough to object - I know from experience that this will happen only too soon. 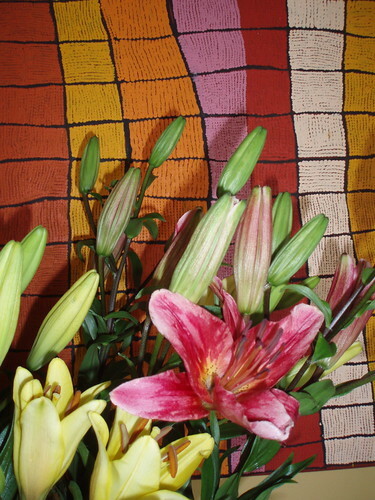 The lilies and the painting have such different origins, but the colours are so perfect together. The painting is an untitled work by Josephine Nangala, and came from an exhibition of work by Kiwirrkura women, who are part of the Western Desert Papunya Tula Cooperative. 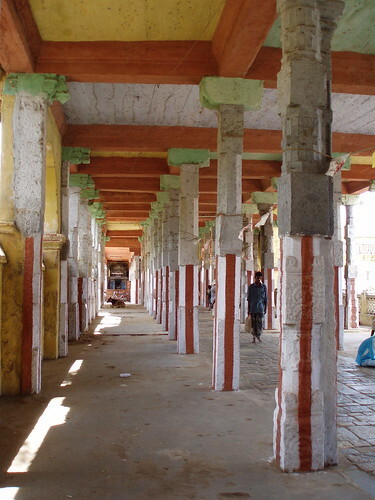 I think it was while visiting India that I was was really smitten with the charm of pink (in its many Indian manifestations) and yellow together - to add another cultural dimension to this colour story. Anne, my backtack 4 parcel is now on its way to Denmark.